Published on 22 October, 2016 in Fedora and FOSS. 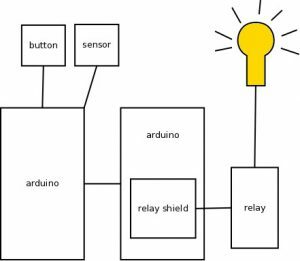 2 Comments Tags: arduino, ha, home automation, Linux. In Part 1 I discussed motivation and research where I decided to build a custom, open source wired solution. In this Part 2 I discuss the design and the prototype that proved the design. Although there are options like 1-Wire, I decided that I wanted more flexibility at the light switches. Of course this doesn’t just control lights, but also towel racks, fans, etc. Running C-Bus cable means that I can more easily switch to their proprietary system if I fail (or perhaps sell the house). 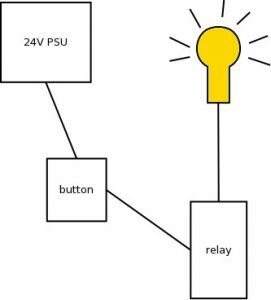 A relay is fine for devices such as LED downlights which don’t draw much current, but for larger devices (such as ovens and airconditioning) I will use the relay to throw a contactor. For the network messaging I chose MQTT (as many others have). The way it works would be for the relay driver to subscribe to topics from devices around the house. Those devices publish messages to the topic, such as when buttons are pressed or sensors are triggered. The relay driver parses the messages and reacts accordingly (turning a device on or off). However, I realised I wasn’t going to get this working in time. I needed a “dumb” mode that wouldn’t require any computers to turn on the lights at least. So, the dumb mode looks like this. Relay fires the circuit and light turns on! We created a demo board that supported both dumb mode and smart mode, which proved that the concept worked well. The dumb lights work without input from the smart network. In smart mode, the Ardinos and Pi are on the same HA network and connect to the broker running on the Pi. 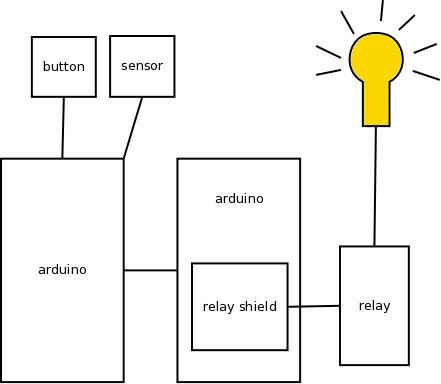 The input Arduino publishes MQTT messages from inputs such as sensors and buttons. The relay Arduino is subscribed to those topics and responds accordingly (e.g. controlling the relay when appropriate). Also played with pulse width modulation (PWM) for LED downlights. Given the smart power packs, I cannot dim on the DC side, unless I replace the power packs (which is expensive). 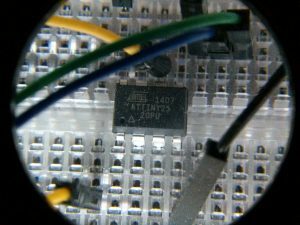 In future, I plan to put some leading/trailing edge dimmers inline on the AC side of my relays (which will need an electrician) which I can control from an Arduino or embedded Linux device via a terminal block. This should be more convenient than replacing the power packs in the ceiling space and running lines to control the ATTiny devices. Doors are complicated and have quite a few requirements. I’m not sure what route I will take here yet, but it’s been cabled up and electronic strike plates are in place. At this point I had a successful prototype which was ready to be rolled out across the house. Stay tuned for Part 3! I wonder what you’r doing with the controller. I’ve read that you’ve chosen a Raspberry Pi with Fedora? What kind of software do you want to use to control? Are you buidling it by uyourself? With MQTT and a RPi I’ve chosen for openHAB. It’s very powerful but with v1 it took some time to learn. Now with v2 it’s easier to use. In the last 24 hours I’ve been more and more dissapointed with how “open” open sources are. All the manufacturers want to sell you overpriced premium hardware and slick software to do their own cut down version of automatoin and then stick you with fees and charges all the way down if anything has to change.